The Harvester is a relay race for teams of 7 or 5 runners, held annually in late Spring, with some running at night. 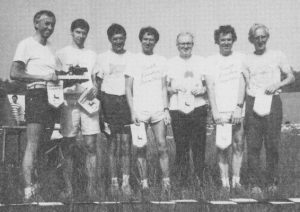 It was started by the Combined Harvester Club in the late 1970’s with just the 7-person course. They ran it for some years, now it is put on by a different club each year. SLOW last organised in 2014. The relay was modelled on the Scandinavian Relays that are a focal point of the calendar for clubs there, with attendance well in the thousands. Clubs use such a relay to rally the club, as it catches the imagination of runners and provides inspiration through the winters. The Harvester has never managed anything like that here, but it has enough fans that so far someone has always come forward to put it on, and there have been enough entries to keep it going. For a club to field a team, particularly a 7-person one, is not necessarily easy. So far SLOW has always managed this; usually we are able to put out several teams, and we are proud of our record of participation. Travelling our website you will come across several photos of members in 7’s or 5’s, these are usually Harvester teams. They often do well. Here’s the team that won the Handicap Class in 1991!